How to provide better customer support on Magento in 2018? Magento empowers the number of retailers and brands with the best flexible eCommerce platform to build your store and grow your business the effective use of customer support can boost your business. Magento is the most trendy word which doesn’t require any introduction when we talk about e-commerce platform. It’s an open source platform written in PHP which capacitates countless brands, retailers, and sellers with the prime e-commerce platform and its flexible solutions for the continuous growth. Due to the flexible cloud solutions, its getting hit by the top brands and retailers. Only Magento open-source can smartly tackle the dynamic buying pattern of the customers. 1- Customers are the key to any business and an online customer support is your only way to provide your customer an immersive experience of your services. 2- Efficient and fast customer service build trust among customers. 3- Providing relevant customer service you can win the heart of your customer for lifelong and customer prefer the company which provides good customer service than price. 4- Customer service is the only tool to reduce the pain points of your customers. 5- Reliable customer support will lead customer satisfaction and which will get positive reviews and ratings for your business. 6- Positive feedback will attract new eyes to your business. 7- Customer service is the only way for the improvement of all over the business. 8- If you are giving right customer service then you don’t need to pay for marketing and advertisement of your business. 9- It increases brand awareness. 10- This will help you to get loyal customers for which every big company is paying much amount. 11- A great helpdesk provides complete e-commerce solution and customer support as well. The effective way to provide reliable customer support is to make use of helpdesk system or to use a connector for the same. UVdesk is highly customizable, flexible and mobile responsive complete e-commerce helpdesk system which provides multilingual and multichannel support using lots of advanced features, tools, and tactics. UVdesk has been built upon advanced technology and API, which allows customers to integrate, configure and customize as per their requirements irrespective of their business. It’s better to think about future change and build the product so that you can add the new feature to your product instead of creating a new product for that particular feature. 11- Economical than to keep a person to manage all the stuff using the traditional method. 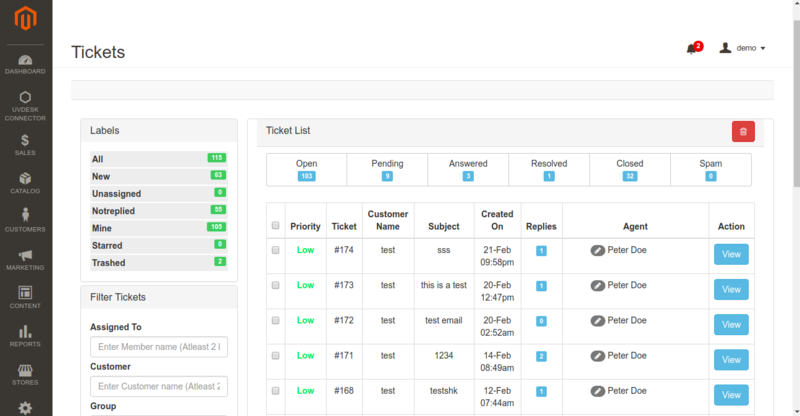 Ticket Administration– To manage tickets coming from different channels there are multiple tools like ticket priority, labels, tags, task, agents, type, status, and collaborator which will make your work easy and faster. Marketplace Integrations– Now you can connect your marketplace apps like Mercadolibre, Amazon, and eBay to convert your customer’s messages or query into UVdesk ticket and to fetch order related details on UVdesk. E-commerce Integrations- Now, provide real-time customer support using order validation system after the Integration of your e-commerce store with UVdesk. Multi-channel Support– UVdesk Helpdesk provides customer support through multiple channels like email, website, forms, social media channels, e-commerce or marketplace channels etc. Social Media Apps– Now you can integrate your social media apps with UVdesk in order to solve your customer’s query coming from your social apps. Every post, comments, and feeds will convert into the UVdesk ticket which can be managed by the UVdesk tools and functionality. Workflow Management– Admin can automate the process so that he should not repeat the same work, again and again, using some set of events, conditions to perform an action. Form Builder App– Create beautiful and effective embed custom form on any website or platform which suits your business requirements. You can create contact forms within a few minutes. The reason being is so simple that you don’t have to write CSS or HTML. It’s easy to use because of the following facts- No coding required, Highly flexible and Secure. Binaka App– It’s is a small lightweight widget app that connects with your company’s knowledge base, which can then be easily embeded into your website to provide your users with quick support. Once embeded, users can quickly search through your entire knowledge base to look for any relevant content that may help resolve their query through the widget. Seller Buyer Chat App– Power your helpdesk system with Seller Buyer Chat and provide better quality support. Provide instant support to your customers by enabling your customers to talk with designated agents over chat establishing a real-time communication between the customer and agent. Examine Agent’s Performance– You can quickly check the performance of any of your agent using Agent Insight option which will uplift your customer support to the next level. File Viewer App– No need to search and download files, again and again, using this app every file which has been shared between agent and customer can be viewed anytime on the ticket. Import Data– Import the data like agents, tickets, teams, groups, customers from the third-party helpdesk ( Zendesk, Freshdesk, osTicket, Help Scout) to UVdesk effortlessly. Email Management– You can configure your email id with UVdesk in order to convert all your customer’s email into the UVdesk ticket. Knowledge-base– You can create knowledgebase, FAQs for your customer so that they could help themselves. E-commerce Helpdesk Connectors– We have built few plugins which user can buy for free. So that they can provide great customer support from their store backend. You can integrate your UVdesk Free Helpdesk For Magento 2 with UVdesk and can provide customer support alike helpdesk. But I would suggest using helpdesk instead of using connectors. UVdesk – Magento 2 Free Helpdesk Ticket System is an amazing extension which allows the customers to create support tickets regarding their queries. The customers can easily create a ticket from the UVdesk option available in My Account section. 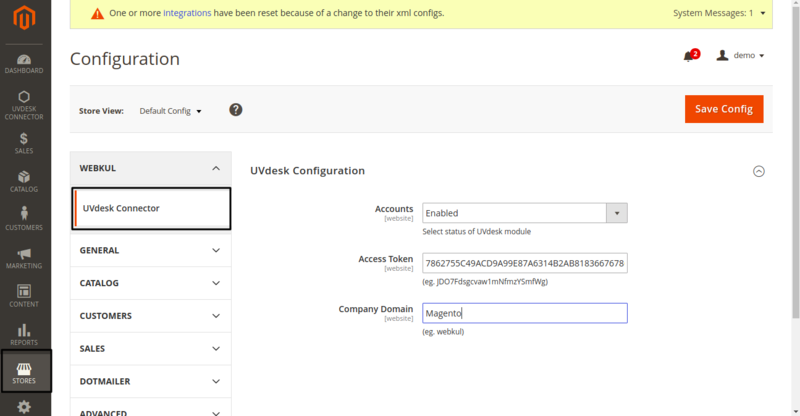 The admin or its assigned agents can manage the tickets either from Magento backend or from UVdesk Dashboard. With the help of UVdesk Connector, all the information about the tickets is automatically synchronized between your Magento store and your UVdesk Dashboard. Every ticket has a unique ticket number assigned to it which helps in managing them. Information such as ticket status, ticket priority, ticket labels, the number of replies etc can also visible by the admin and agents. Having a helpdesk ticket system for any kind of business small or big is very much necessary for providing customer service and support. The admin can enable or disable this module from the back-end. * This module integrates UVdesk Helpdesk System with Magento Store. * Only registered users are allowed to create a ticket from the front-end. * Ticket reply to the customer can be sent either from Magento back-end or UVdesk Dashboard. * The filter option can be used to search any specific ticket using various properties. * A detailed information about the ticket is displayed using different labels and statuses. * The admin and its assigned agents have an option to attach any supported file in its reply message. * All the tickets can be managed either from Magento back-end or UVdesk Dashboard. In case of any doubt and query please email us on support@uvdesk.com we would be happy to assist you.